This is a theoretical chapter which aims to integrate various epistemologies from the philosophical, knowledge management, cognitive science, and educational perspectives. From a survey of knowledge-related literature, this chapter collates diverse views of knowledge. This is followed by categorising as well as ascribing attributes (effability, codifiability, perceptual/conceptual, social/personal) to the different types of knowledge. The authors develop a novel Organisational Information and Knowledge Management Model which seeks to clarify the distinctions between information and knowledge by introducing novel information and knowledge conversions (information-nothing, information-information, information-knowledge, knowledge-information, knowledge-knowledge) and providing mechanisms for individual knowledge creation and information sharing (between individual-individual, individual-group, group-group) as well as Communities of Practice within an organisation. Epistemology is the study of knowledge which includes what it is and how it is acquired. 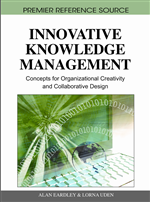 Nonaka and Takeuchi (1995) emphasise the need to understand what knowledge is, know how to manage it, and exploit it to increase an organisation’s competitive advantage. They view every member in an organisation as knowledge workers where new knowledge always begins with an individual which can then be transformed into organisational ‘knowledge’. In this chapter, we would like to address a few issues. Firstly, there is a need to revisit seminal epistemology and unify them with contemporary epistemology so as to uncover the elusive meaning of knowledge. Secondly, there is general lack of consensus over tacit and explicit knowledge as well as information and knowledge, which will affect knowledge management in organisations. To address these two issues, we have developed an Organisational Information and Knowledge Management Model to tease out the differences between information and knowledge for an organisation’s benefits, and have provided mechanisms for individual knowledge creation and information sharing among individuals within the organisation. The Organisational Information and Knowledge Management Model is grounded on philosophy, knowledge management, cognitive science, educational theories, and is consistent with Wiig’s (2002a; 2002b; 2004) New Generation Knowledge Management (NGKM) which addresses people-centric knowledge developments (e.g. how people learn, possess knowledge, apply knowledge, etc.). The discussion in this chapter is divided into two sections where the first section will present the outcome of a survey on epistemology related chapters in philosophy, knowledge management, cognitive science, and education while the second section, a conceptual design of an Organisational Information and Knowledge Management Model. In this chapter, we have categorised epistemology into the following: seminal epistemology (rationalist approach, empirical approach, pragmatic approach, social approach); contemporary epistemology (cognitive approach, knowledge management approach: pluralist epistemology). Pluralist epistemology is further divided into the following categories: dichotomy model of knowledge; multiple model of knowledge; continuum model of knowledge; duality model of knowledge; and knowing model of knowledge. The conceptual design of the Organisational Information and Knowledge Management Model aims to tease out the differences between information and knowledge, followed by depicting mechanisms for individual knowledge creation and information sharing, and finally Communities of Practice within the organisation.